The iPhone 3.0 software update isn’t slated to roll out until Wednesday. 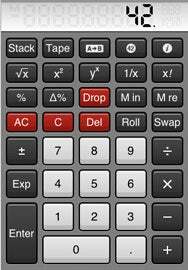 But developer TLA Systems isn’t waiting around for the new OS to update its well-regarded calculator app. The latest version of PCalc, arriving at the App Store Monday, has been built for iPhone 3.0, adding support for copy and paste. Double-tap or tap-and-hold to copy or paste in the latest version of PCalc. To access this newfound functionality, TLA Systems says, just double-tap or tap-and-hold the LCD screen of your iPhone or iPod touch to copy the displayed value or paste in another one. That’s not the only feature that’s been added with PCalc 1.6. The new version adds a new Engineering vertical layout that includes all the functions from the horizontal equivalent. There’s also a new Programming layout, available both horizontally and vertically, that’s geared toward hex, octal, and binary calculations. Finally, the 1.6 update adds support for regions that use a quote as the thousands separator, and there’s a fix for a display problem with the tape in hex mode. The $10 PCalc isn’t the only TLA Systems offering that’s ready for the brave, new iPhone 3.0 world. The developer also released version 1.6 of the free lite version of PCalc, adding support for both copy-and-paste support and for regions that use a quote for the thousands separator.